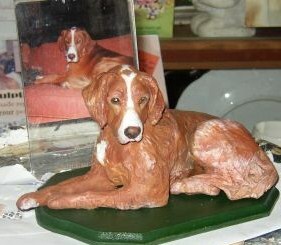 Kathryn Nicholas has magic sculpting finger tips, working only from photographs she can produce a lifelike figurine of your loved one. 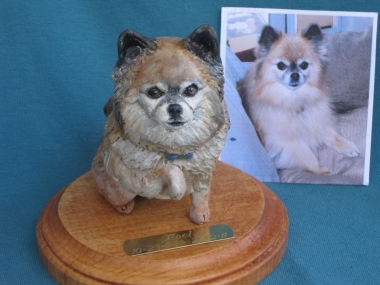 These are immensely popular with all, and are an important keepsake once a friend has died. 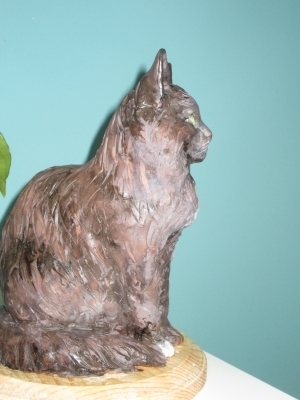 Kathryn's work is mainly in dogs, but cats are often commissioned too, "While I do receive about 50% more orders for dogs than cats, I have sculpted many felines and find that cat lovers are every bit as warm hearted as those who have dogs. Personally, I am a dog-person. Starting at age 3, so the story goes, I opted out of my small bed to sleep curled up with our Poodle, in his bed. 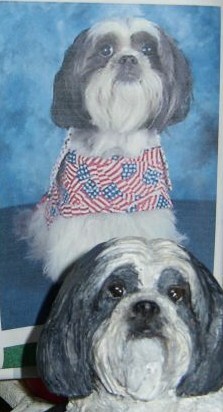 My love for canines was born with me. I love everything about them whether they are sleeping or awake, in a playful mood or not, they fascinate me. I find nothing more relaxing than time with my dogs." 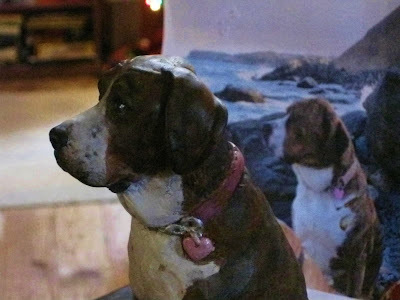 The following is a response to a series of questions I presented to Kathryn, which will give you an insight into a caring lady who loves dogs, and it all shows in her commissioned figurines. 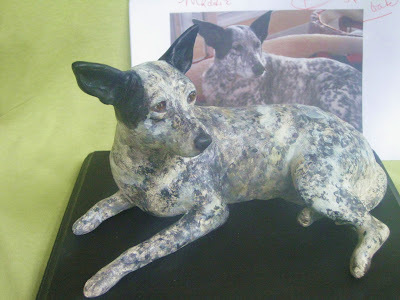 "I began sculpting on a whim in about 1999. My English Setter had had eight puppies the year before, and we kept one: a regal red feathered male. His breed we did not know. It seemed that a Golden Retriever had jumped the back gate, and so these beautiful mixed breed pups were born. 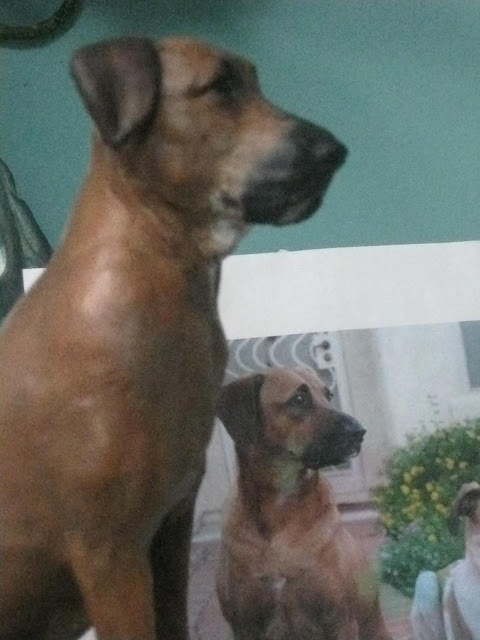 I wanted a replica of this red dog, and unable to find one to even resemble him, I decided I could create one. "From an artistic family, I think my inspiration for this art is just who I am. "My actual business however, began in 2004. 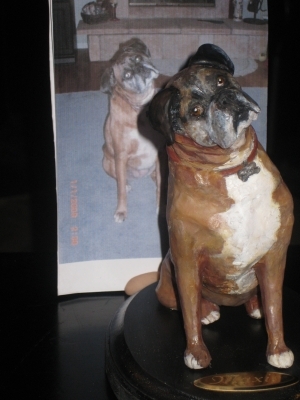 Again, just seeing what I could sculpt, I created half a dozen pieces from pictures I found in magazines. 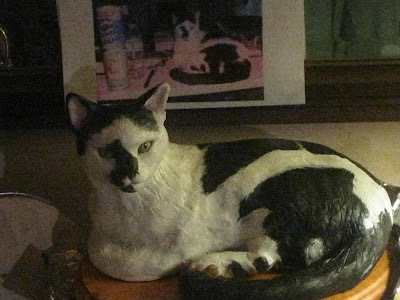 The more I sculpted, the more I loved it. 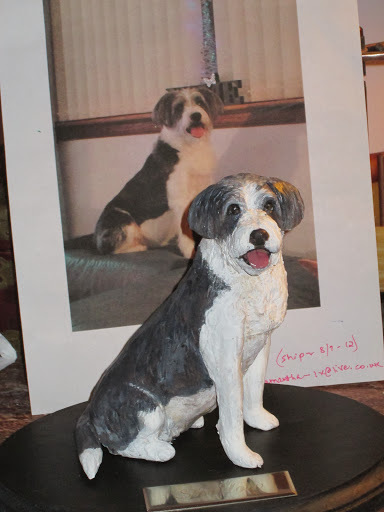 From there, a manager in a local coffee shop agreed to display my dog sculptures along with a stack of business cards, and my home phone began to ring: I was getting requests to sculpt people's pets! 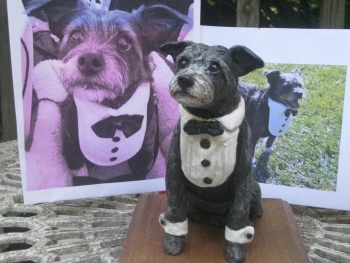 "I have a web site, www.mypetsculpture.com, which is the way I show my work, and over the past ten years, come into contact with wonderful pet-people from all over the world. An English major and writer, I have always been in one creative field or another. 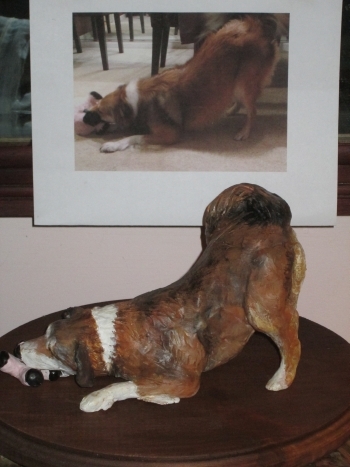 "My son put together my first web site and I thought of its name: My Pet Sculpture. I work only from photos, and my prices range from US$190 to $525, plus shipping. "I have shipped as far away as Singapore, and work regularly with customers in the UK. The majority of my work is from the USA, but I ship to any location. 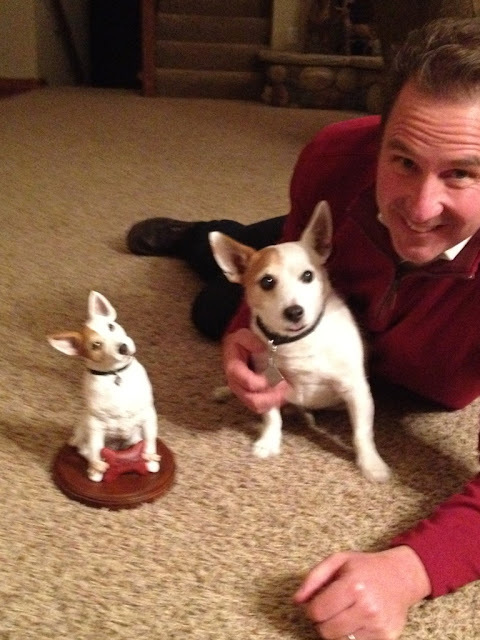 "I meet the most loving customers - some of whom are in tremendous grief after a pet loss. I put my heart into creating just what they want, and receive extremely supportive feedback. It is the most satisfying work I have done, and is really more of a gift than work. The longer I chat with customers, the more they teach me what they really want. From this relationship, I added Memorial sculptures. 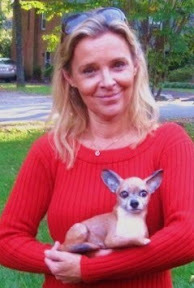 Pet loss can be devastating, which I too know first hand. But as time passes, I am learning to be mainly grateful for my time with every dog I love. So my favorite quote is: "Don't cry because it's over; smile because it happened." That's an important truth for me, and one I live by. 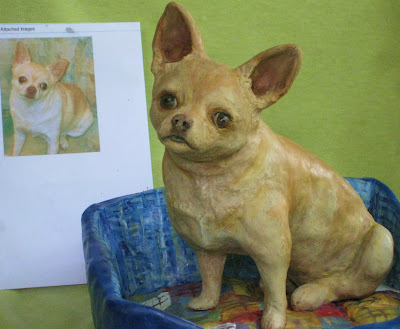 "In my non sculpting hours, I am outdoors, doing anything and everything, from gardening to dog walking. It's my favourite place to be! 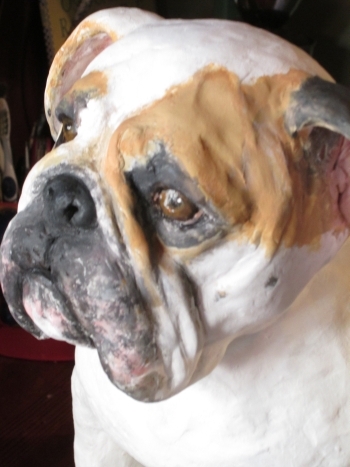 And in the warmer seasons, it is also where I sculpt." Scroll down for more fabulous examples of Kathryn's work.